Message Body: How ya going, was wondering if you guys do a lift kit complete for a 99 gu patrol ute? Profender themselves don’t do a full lift kit, they only make shocks… but we here at Superior Engineering we have got full kits listed with shocks from Profender. What is the application and intended use of you’re 99 Gu Nissan Patrol? Message Body: ADJUSTABLE REMOTE RESERVOIR SMOOTHIE 2.0 SHOCK (PIN) I have and 80 series landcruiser, Rear pin top to eye lower, 6″ lift, Looking for the open and closed measurements in mm for a shock close to 440 mm closed and 750 open. You have two options similar to those measurements. Unfortunately we are out of stock of both of those shocks at the moment, however they are due in the coming weeks. Let me know which one would suit you best. Was wondering if can help do uses guys do front 90/95 series prado shocks with remote reservoirs I have your shocks on my GU comp truck and now wanna continue using them on my class 7 prado I’m building. Unfortunately there are no remote res shocks available for that vehicle. Message Body: just wondering the price on this kit? Can I get a bit more info as to what kit it is your looking at, as it has not come through on your enquire. Message Body: hi I got a 1989 Toyota pickup 4×4 and I’m wondering if there are any shocks or lifts that will fit my truck? We have quite a few options available for those vehicles. Do you know what size kit you want? Where are you located I can get a postage price for you. Message Body: hi i just wanna ask if u have lift kit for isuzu d-max 2012 please let mi know ASAP thanz. We a have a few options to choose from do you have any preference on brand? Here is a link to all the kits available. Subject: 200 series lift kit. Message Body: I would like a quote for lift kit for 200 series toyota vx year 2009. We have put together a comprehensive 2” suspension kit to ensure reliability and performance for the 200 series Landcruiser. This kit is $3789 and we can also offer installation. If I can assist with anything further, please don’t hesitate to contact me directly. Subject: 5 inches Liftup kits for Toyota Revo 2.8 2016 model. Message Body: Hi, I’m looking for my toyota hilux revo 2016 5 inches liftup kit. Need some of your advice on your products. Unfortunately at this stage we don’t have anything available for your model. Sorry we couldn’t be of assistance. Message Body: I would like to know if I can order to Papua New Guinea? I am after 3 inch or 2 inch suspension kits for my Toyota Land cruiser Prado 120 series 2007 model. Yes we are able to arrange delivery to you in Papua New Guinea, alternatively we do deal with Gary at Wheels Ltd, Koani Street, Gordons. If you would like to get back to me with some parts you are considering or any questions you have we will be able to work out the best solution for you and go from there. Message Body: Hi, I have a 2014 hilux and I was thinking about lifting the front 3″ and back 2″ with suspension, is there anything that I have to take into consideration? Such as excessive wear on anything or breaking? Or any other modifications that would be required such as extending brake lines or anything to do with the CVs or anything like that? Thank you for your email regarding lifting your 2014 Toyota Hilux. It is common for us to see this model of Hilux sitting taller in the rear than in the front, so all of our lift kits aim to “level” the vehicle front to back. With that in mind, our 3″ lift will level your car, in much the same was as a 3″ front and 2″ rear lift would. When it comes to lifting this model of Hilux 3″, there are a few components to consider, most of which you have touched on. –	These are not an issue, so all clear there. –	Once you have lifted your Hilux 3 Inches, your front CV shafts will be forced to operate on angles outside of their design parameters. –	The diff drop kit lowers the front diff housing, and reduces the angle your CV’s operate on. Less angle equals less wear, which will lead to a longer lifespan. –	Factory Upper Control Arms bind on your front coil springs when a lift over 2 inches has been performed. –	This Banging and clunking is not a nice sound and leads to wear / cracking on the arm which is unsafe. –	The factory ball joint is also forced to work outside of its design limits at a 3 Inch lift. –	These arms are designed to clear the coilover assembly through the entire range of suspension travel. –	Our arms also utilize a Spherical Bearing in place of your conventional ball joint which allows a lot more travel with less binding issues. –	The front sway bar will have clearance issues at this height. If you have any further questions or enquiries about lifting your Hilux, please do not hesitate to email me back directly or call (07) 5433 1411. Message Body: Look for a 3″ to 4″ lift kit with coil overs or whatever you suggest. Please see below link for the height adjustable strut we have available. Please kindly note that a 3 to 4 inch lift on your model will require a number of other components to correctly align everything, below is a list of other parts we highly recommend replacing. Looking for a OEM type replacement suspension set up with a 3 inch lift on front and a 2 inch lift on rear. Looking for remote reservoir type set up for both front and rear. Is that something you guys could do? Its to suit a 2016 MY17 Holden Colorado Ute. At this stage we do not have a remote res solution for your vehicle. We do however have some products coming that should be available in the next month or so. Message Body: Hi would like a price for a 5 inch superflex kit for a gq patrol rb30 duel fuel and any info to go along with them thanks. There’s quite a few options in regards to a 5″ Superflex kit for your Patrol. Would it be possible to give you a call to discuss and match up the best package with what you would like to achieve from your set up? Message Body: I HAVE A TOYOTA HILUX 2007 FITTED WITH A TWO INCH BODY LIFT AND A 2.5 INCH FRONT STRUT SPACER ON 305 70 R16. I WOULD LIKE TO CHANGE MY TYRES TO 315 70 R16. WHAT SUSPENSION LIFT KIT WOULD I NEED INSTEAD OF THE FRONT STRUT SPACER? HOW MUCH WOULD IT COST ? Fitting 315’s to a hilux will require more than 4″ of suspension and 2″ body lift. Message Body: Just after a price on this kit and Postage/Freight price to be sent to Darwin NT. Thank you for your email regarding out Superflex Kit options for your Nissan Patrol. We no longer have the Profender range of Remote Reservoir Shocks available. We have phased them out in favor of our Superior Engineering Remote Reservoir Shocks. Profender manufacture these shock absorbers for us to our designs and specifications, so the build quality is still excellent. Our Superior shocks have a longer travel per lift than any other shock on the market. Meaning our 5″ Front Shocks have more than a Tough Dog 6″ lift Shock. With this in mind, we do offer the exact same kit as the one you have enquired about, but with our Remote Reservoir Shocks in place of the Profender Shocks. The kit price starts at $5,230 and goes up depending on whether or not your Patrol has ABS/Traction Control and if you need replacement Mushroom Bushes for the rear of the radius arms. This kit can be viewed at this link. Freight to Darwin on a kit like this will be around the $250 mark, depending on levis and fuel costs at the time. Message Body: Does your 3″ inch Profender 4×4 suspension kit to suit the Toyota Prado 120 come with a engineering certificate Thanks. No, a 3″ suspension lift will require further engineering depending on which state you are in, if at all possible (State depending). I would recommend contacting your local state transport authority to confirm whether this is an option for you. Message Body: I have a 2012 Toyota Hilux with full ProFender (it is the la sport profender range) what I have in is PROFENDER front shocks, rear shocks, blade springs, coils, diff drop, Sway Bar Relocation Kit, 25mm spacer on top of shock. But stil my back is low and I have 285/75R16 BF goodrich mud terrain on and if T turn, they scratch. What can I do to lift it more. Please let me know what you think and what I can do to get more height. It would appear you have around 4″ inches of lift over standard. This being the case you look to have gone past where we would normally go. Message Body: Hi there I have a Hilux with 3 ” suspension lift and 2″ coil spaces I had to take the spaces out for CVs ect to work with just a normal diff drop kit. How much would I be looking at for the dropped cross member. We can supply The diff drop kit for $165 + freight or fitting and will lower the diff 25mm. Message Body: Hey guys interested im in your 2 inch lift landcruiser 200 series remote res shocks, the problem i have is the picture on the website shows the chassis mount as an eye mount where As from what i can see all 200s have a pin mount for the top of the rear shocks. are your shocks rear lc200 shocks eye or pin mount to the chassis? You are correct the LC 200 shock does have a upper pin mount and eyelet for the lower mount, the picture used is just a generic image. Message Body: Hi there I was just wondering how much the drop diff cross member is by its self I have a 2008 ifs Hilux with 5 ” lift. Subject: I would like to know if you have lift kit (stage 2 – 3 inches)for Prado 120 and what will be the price? Also, I need price of the following parts for prado 120. 2 x Front Profender Adjustable Monotube Remote Res Struts. 2 x Rear Profender Adjustable Monotube Remote Res Shocks. Sorry but we are out of stock of the shock absorbers at the moment. Hopefully we will have back in stock soon. Message Body: Hi just wondering if you guys do a lift kit for a 2009 Mitsubishi triton mn dual cab with the remote reservoir shocks. Thanks. We have our new range of remote res shocks on order for the late model Triton’s, however unfortunately at this stage we do not have an ETA on shipping for them. If you require any further information please don’t hesitate to contact me on (07) 5433 1411. Message Body: I have a 2012 Toyota Landcruiser Prado ZR (150 series, 3 door short wheelbase). I am looking to get the suspension lifted by 3 inches (75mm). Do you have any 3″ suspension kits that would fit my vehicle? And if so, do they come preassembled? What are the purchase prices? Do you have any recommended installers in Perth? Hope this helps any questions please feel free to contact me any time. Thank you for your enquiry into OEM Profender Coilover struts for your Ford Ranger. 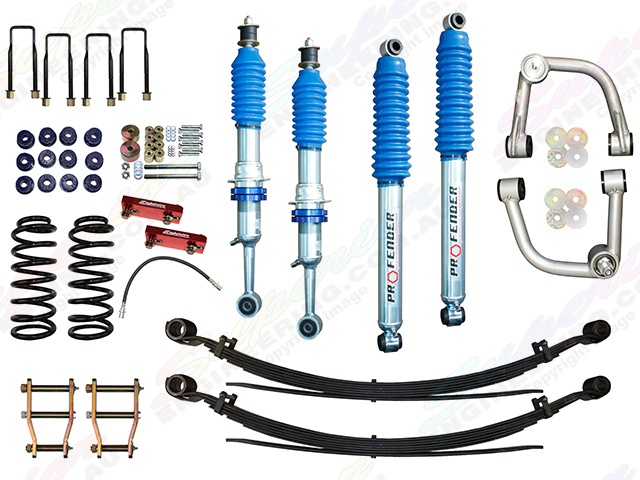 We currently do not have stock of any 2.0 or 2.5 OEM Coilover Struts to suit the PX Model Ranger. Right now we can offer adjustable Ironman 4×4 struts for the front of your Ranger. These struts retail for $286 ea. A pair of coils will vary in price depending on brand (roughly $190-$250 per pair) with replacement tops coming in at $70 ea. You can find these struts here. If you have any further questions about the struts, or setting up your PXII Ranger, please do not hesitate to email me back. Message Body: I am restoring a Chevy K5 blazer 1977. I need some guidelines about the sorts and types of shocks I can use. The vehicle is lifted a little higher. Thank you for your enquiry into the suitability of Profender shocks for your Chevy Blazer project. Unfortunately we do not have any shock options available for the Blazer. This unavailability is due to the vehicle not being sold locally here in Australia, or in Thailand where the Profender manufacturing plant is. i want 4 shocks PAG-2601P and 6 shocks of PAG-2001P also For isuzu Trooper /Holden Jackaroo PAG-4660P and PAG-9001P i want 2 shocks PAG-4660P and 2 shocks of PAG-9001P if You can ship it to dubai UAE I want know the last price that you can offer + the shipment cost. Best regards Mohammed. Unfortunately we do not stock those particular part numbers, we are just the Australian agent for Profender Thailand. You could try contacting Profender directly and see if they are able to sell directly to you or point you in the direction of a local dealer in the UAE. The below link is to Profender Thailand’s contact details. Message Body: I need a 4-6¨ Suspension lift kit for a 2016 Toyota Hilux 4×4, do you have a kit available for my application? No sorry, nothing available as yet. Im just wondering if i could get full front and rear 5″ suspension lift for my 011 Hilux. with coils, best shocks best everything and i want be able to get massive flex on front and rear. Be able to with stand rough 4×4 driving and be able smooth ride with 35″ mud tyers. Good morning Benny, Thank you for your enquiry. The biggest lift I can offer you for you Hilux is 4inch as that in our opinion is pushing the vehicle to it maximum limit with its front suspension configuration. The 4 inch profender kit is $3890.00 it comes with everything you will need to complete a 4 inch lift in the front and a 3inch lift in the rear as nobody makes a 3 or 4inch leaf pack for that vehicle. As far as trying to get flex out of the Hilux at 4inch you will very little down travel in the front due to the nature of the front strut setup and because the front coils will be preloaded to get the lift height the ride quality will be very stiff. About the only way to try and get it any higher would be to do a solid axle conversion in the front and changing the front setup, which would be a costly exercise. Message Body: Hi to all. I’m one enthusiast of off-road and in Toyota trucks as well Did you have any interest in export your products to Brasil If yes , we are interest in represent you here. Please advise your comments. So maybe we can go further and think in how it can work for all of us. We are an Australian based company and are the authorised agent in Australia to distribute the Profender range of shocks absorbers so for direct enquiry to the Profender range you would be best to contact Profender in Thailand. We do however have wide range of our products available for Toyota vehicles including a large range of unique products not available elsewhere, I would encourage you to have a look through our website and see if anything is of interest to your company. We currently export to many countries and have a large following here in Australia. If you think we have products that will be of interest to you please do not hesitate to contact us. I would like to know if there is a possibility of getting 2.0 Performance series coilovers for Mitsubishi Pajero NM 2004. Good morning Tilen, unfortunately that particular type of coil over strut is not available for the Pajero. Message Body: Hi i am searching for Remote Reservoir Shock for my 2015 Suzuki jimny .. can you help me for that? Sorry but we (Australian Profender distributor) do not stock the Remote Reservoir shocks for your particular model. You could maybe try Profender directly to see if they are able to assist or point you in the direction of your local distributor, below are their contact details and vehicle listing. Message Body: Good evening.. I’m really interested onthe 3″ lift kit for the land cruiser 120. Is it still available and is it possible to send it to me. I’m sending you from Athens Greece..!!! Yes we are able to arrange delivery to Greece, we are just out of the shock absorbers now but are expecting them back in stock early next year. I’m interested in a 5″ kit for my hilux I was wondering when you will have these in stock and also what is the price fitted and how long would you need the vehicle for? Unfortunately the 5″ kit is no longer available. We can do a 4″ Profender kit for you for installed for $3600.00 as we are having a special until the 7/12/16. We just need a 20% deposit to secure the pricing. Message Body: Hi I’m looking for nitro charger shocks for my hilux 1999, LN165 tiger shape hilux .. I want it in Pakistan what would be the best and easiest way to get the complete suspension 3 inch lift .. And what’s the best price you can offer me? Sorry but we don’t stock the Profender shock absorbers for that particular vehicle. We do have a couple other options available however, below is a link to the options available. Message Body: Hi guys, I have 1995 75 series HZJ Landcruiser which has noticeable bump steer back through the steering wheel on freeway commuting. I have BFG mud terrain 305/70/16 tyres running on ROH Impact alloy rims. I have had all leaf springs and bushes replaced and all wheel bearings checked and serviced. I currently have a heavy duty ?dog adjustable steering damper. After getting the new springs,etc the bump steer was somewhat better, but after getting the muddied the bump steer issue is back. Do you think the RTC damper will fix this? and how much is it?. Hi Tony, Thank you for your enquiry, if you are saying that the wobble has come back since you have put your mud tires on the vehicle, the first thing I would be checking is wheel balance, what width rims are they if they are narrow running big tyres on them can be quite difficult to balance especially mud tires. An RTC damper may or may not fix the issue you have, have you tried adjusting the damper up to as stiff as it will go, did this make any difference? Message Body: Just enquiring about your Monotube Remote Res shocks for GQ/GU Patrols and how far the shocks travel (both ways). I’m looking at purchasing a set of 4 inch fronts and 3 inch rears to go with my 3 inch springs all round. Message Body: I currently have the profender 2″ lift shocks on my 2014 Ford Ranger PX. I need to have them replaced with a new set. Can you tell me the price and what information I need to provide in order to purchase and have them shipped? Thank you for your enquiry into replacement Profender shocks and struts for your PX Ranger. Could you please supply me with some photos of the shocks currently fitted to your vehicle? That way I can ensure we supply you with the correct replacement items. Just an enquiry to get some info on the return to centre steering dampeners. Do they come to suit GQ Patrols and also my SWB GQ has a 3 inch lift and 2 inch body lift, do I need to get a different size dampener or will the standard size do? Yes the ProFender RTC is available for the 1990 Onwards Gq Patrols which will suit all lift applications. If you have a pre 1990 model vehicle you can still adapt one to your vehicle with the addition of 2 mounting brackets. To suit my 80 series race truck. Not real sure on gross weight yet. Thank you for your enquiry into 16″ Coilovers to suit your 80 Series Landcruiser. Due to the size and weight of your vehicle I would recommend use of the 2.5 Coilovers. The Coil springs to suit the 2.5 Coilover retail for $125ea. With 2 coils required per Coilover, you would be looking at 8 in total for the vehicle. Total Cost – $2,480.00 including GST. Freight cost on this order would be calculated as per your post code (Please supply for a freight quote). –	The Profender Coilovers do not come with a useable tune built into them. They come with a generic shim stack inside that 9 times out of 10 does not suit any application. –	If you aren’t comfortable with re-valving the Coilovers yourself to suit your vehicle set up, we can tune the shocks for you – (This will incur a labor charge). –	To be able to do this we will need to know a fair bit of vehicle information. –	The tuning stacks we come up with will be based on this information that you supply us. You may find they end up being on the mark, or slightly off it. We can only suggest what we feel will work based on the information you supply. –	The Vehicle will need to be mostly assembled before this discussion can begin. –	Once the vehicle is fully assembled, that’s when we can discuss the spring rates to suit the 16″ Coilovers. –	We require a lot of detailed information about the vehicle, how it is built, end weights etc. which is why we like to wait until everything is built before having this discussion with you. –	As with the internal valve tuning, the coil rates will be suggestions only based on vehicle information supplied by you. I’m happy to work with you through this stage of your build to ensure you end up with Coilovers that will work in your Landcruiser. Message Body: Just wondering when you’ll have the 5 INCH SUPERIOR PROFENDER LIFT KIT TOYOTA HILUX in stock and what’s the price. Thank you for your enquiry regarding the 5″ lift to suit your Toyota Hilux. Unfortunately, we no longer supply 5″ lifts for any model of Hilux. We found that ride and handling characteristics suffered badly at this height. Engineering for road use was also impossible to obtain in every state of Australia. The tallest lift we do for your model of Hilux is a 4″. Below is a link to all of our 4″ lift kits options. All of these kits contain the same components, with the differences between the 4 being the shock choice. All of the kits include every component you need to correctly lift your Hilux to 4 inches without any issues. Please be aware that at this height, your Hilux will handle vastly different to the way it handles now. You will also lose a lot of wheel down travel in the front end. Message Body: Hi, just enquiring on the price of a 4 inch lift kit all round for my 2012 SR5 dual cab. What else needs to be done to the vehicle and will I need a road worthy done to for it to be legal? I’m new to the 4WD scene. in Queensland the maximum legal suspension lift is 2inch, you would need to try and find an engineer who would be willing to sign off on a 4inch lift for it to be road worthied. I want the 4″ lift kit for the toyota hilux 2014 model please send to me price and shipment to south africa please. Below is a picture of the kit and also the link to our website that lists the kits contents. I have also included the link to a couple of other kits we do have available but as far as value for money the recommended kit is the one in the image. Once you have had a chance to look over this please get back to me with any questions you may have. We will also have to confirm if your model requires the 2 rear brake lines or if the vehicle just has the one single line fitted, if you only have the one brake line the kit will be cheaper as I have quoted based on 2 brake lines. Subject: Suspension kits for 2012 land crusier. 3 inch lift. Message Body: Do you have kits for the V8 troop carrier and prices please. Hello Wolfgang, We don’t have a 3 inch lift kit with profender shocks, We do have a few different options for 3 inch kits I have copied a link below to our website with the available options for you. The kit prices won’t change with regards to different spring rate requirements as we customize each kit to suit your application. if you are looking for a remote reservoir option I would recommend our Superior Engineering remote res kit with either superflex or dropped radius arms, have a look at the different kits and see if there is a suitable option for you. If you have any other enquiries please feel free to contact me. What kits can you recommend for a Prado 90 (absorbers and springs). I would like those with the remote reservoir. I have a steel bar and winch in the front and at the rear one spare tyre and some gear which is about 100kg. Unfortunately we don’t have a suspension kit available with remote reservoir shock absorbers to suit your 90 series Prado sorry. Although, I’m more than happy to recommend other kits. I just need to know what’s the main use of the vehicle, and the style of off-road driving you do to suggest the best options for you. I am looking for complete kit (front & rear) for Nissan Patrol Y62 2011. Please can you send details about the available kits you offer? We are the Australian distributor of Profender and unfortunately we do not stock the range of shocks for the Y62 Nissan Patrol. Below is a link to the Profender Thailand website. I am wondering do you guys still do the 5 inch lift kits for Toyota hiluxs? The tallest we can offer are 4″, but this depends on which model you have. Some models we only go as tall as 3″. More detailed information on your vehicle will help with identifying which kits we can offer you. Message Body: Can you give me an availability on your 14” triple bypass shocks, its off season now but I would like to have them fitted to the hillbilly Tuff Truck for round 1 of aust4 next year. Please be advised that all bypass shocks are now ordered in as required, please allow approximately 90 days from placement of order. I want to use my daihatsu independent suspensian, in indonesia is F73 for hunting, thats mean 7 person plus 400 kg weight to carry. I don’t feel secure to put that load on torsion bar for my front suspension, is there any product suitable for this situation? Unfortunately we have no upgrade parts to assist in increasing the load carrying capabilities of your F73. I have a toyota GXV 100 sers v8 IFS. Do they make a remote res shocks for this model Toyota? If so, Can you get them / price. Good morning Frank, We would have remote res shocks to suit the rear of your vehicle but not the front unfortunately, we can use the rear shocks out of a 105 series, they are $335 per shock for our superior engineering Brand of remote res shocks. If you wish to place an order I would need to know what size lift you are running.